Coming upon the long wall of wines at your local grocery store can be an intimidating experience. With so many different choices within so many different wine categories, how can you possibly choose the perfect wine to serve with your meal? Perhaps more importantly, without knowing what all these wine terms mean, how do you choose a wine that you and possibly others will enjoy? To be quite frank, unless you sit down with every bottle and taste it with the meal (not recommended), you will never know exactly what wines will go perfectly with that meal. Wine and food pairing is not a perfect science that you can learn. Instead, Recipe4Living would like to offer some general guidelines for success in pairing wine with food and several do’s and don’t for the beginner’s enjoyment of wine. This article will outline the most popular wine varieties and how they differ. In no time, you’ll feel comfortable schmoozing with the biggest wine snobs. * Let go of your wine assumptions, especially the belief that wine is expensive. You can easily get a great bottle of wine for under $10. As with cooking, the key to good wine is all about balance and not necessarily the rarest grapes. * Have fun! Experiment! Enjoying wine is about what you like, not about what you are supposed to like according to the experts. When you find a wine you really like, simply note the winery and the variety. As you gain more experience with wine, you can include descriptions of different elements in the wine. Better yet, act the sophisticate and host wine tasting parties with friends and discuss different wines. * Look for the increasingly popular screw-cap, as opposed to the cork. The problem with natural corks is that a moldy spoilage can occur in the wine (in 3-5% of natural corked bottles!) because of a reaction that sometimes occurs in the cork. Synthetic corks have attempted to solve this problem, but they are much harder to remove and cannot be used to re-seal the bottles. Old habits die hard, but more and more wineries are switching to the screw-cap. – Whites should be served cold between 43°F and 53°F. This can be done by chilling the bottle in ice for an hour before serving. You do not want to keep a glass of white wine in the refrigerator for long periods of time. – Sparkling wines and champagnes should be served cooler, around 45°F. – Although room temperature is ok, red wines should really be served between 55°F and 65°F, or cellar temperature. 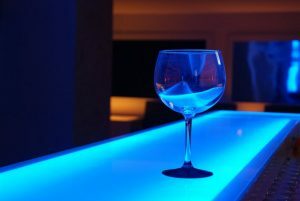 * Despite its reputation for pretension, invest in some quality stemware if you want to truly enjoy wine. The right glass will truly enhance the flavor of the wine and your appreciation of it. 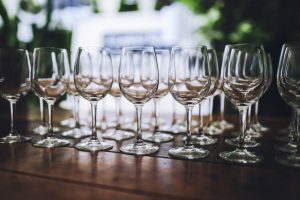 Wine glasses need to have a large cup or “bowl” to allow the wine to breathe, because the interaction with the air releases all the wines aromas and flavors. Removing Red Wine Stains– Truly essential information in the enjoyment of wine. * White wine- Ironically the best stain-fighter for red wine, white wine will neutralize the wine and make it easier to remove. Simply pour some on the stain and blot gently with a rag. Don’t rub or you will force the stain deeper into the clothing or carpet fibers. After blotting up most of the wine, simply clean with your favorite carpet cleaner or stain-fighter as normal. * Club Soda- The carbonation in club soda helps to lift the wine from the fibers. * Salt- Salt acts as a buffer to keep the stain from setting while you look for other cleaning options. Chardonnay- A very drinkable white wine differentiated from other varieties by a special aging and fermentation process in oak barrels. The special oak barrels give the wine its unique aromas ranging from nutty to creamy. This wine can include tastes of vanilla, pear, lemon, pineapple, peach and more. Chardonnay is usually regarded as the white table wine. Muscat/Moscato- This low-alcohol wine has an intensely perfumed aroma and a distinctive musky taste, and is often used as a dessert wine. The aroma of the wine can include gardenia and honey and the taste includes elements of citrus and tropical fruits. Pinot Grigio- More colorful than other white wines, Pinot Grigio is soft and delicately perfumed. The acidity of the wine gives it a nice crispness. The wine’s elements can include flowers, subtle spices, pear, and citrus. Riesling- This lower-alcohol wine comes from the most famous of German grapes and is characterized by a unique fruit and acid balance. Unlike many other wines, Riesling is rarely prepared in oak barrels, making it more adaptable to many types of food, including hot and spicy choices. Riesling is usually a dry wine, with sweet elements of peach and honeysuckle. Sauvignon Blanc- One of the most aromatic wines with fragrances of grass and citrus, Sauvignon Blanc is spicier than the Chardonnay varieties. The taste can have hints of melon, gooseberry, and black currant. New Zealand produces some of the finest Sauvignon Blanc. Barberra- This deep red wine comes most successfully from the Piedmont of Italy, and is heavily planted in the Central Valley of California because of its ability to withstand high temperatures. A full body, luscious berry flavors and crispness from the high acidity characterize this wine. Cabernet Sauvignon- These full bodied, intensely flavored red wines tend to improve with aging, often spending 15 to 30 months aging in oak barrels. Such aging gives the wine toasted vanilla and cedar tastes, while the wine also features plum, black cherry, and spice elements. Now the most widely planted grape in the world, the Cabernet Sauvignon grape actually come from a cross between two French varieties: Cabernet Franc and Sauvignon Blanc. Merlot- A softer and much less intense red wine than cabernet that is ready to drink sooner. The dry smoothness of the wine makes it a popular choice in restaurants. Merlot is often mixed with cabernet to soften its acidity. Descriptions of the wine’s tastes include many of the same as cabernet and green olive, herbs, and chocolate. The Merlot grape responds well to cooler climates making it very versatile. Pinot Noir- Widely regarded as the most difficult grape to grow, this delicate wine is logically one of the most sought after varieties of wine, originating in the Burgundy region of France. This elegant wine can include elements of raisin, black cherry, and strawberry. Sangiovese- This dry red wine is characterized by a smooth texture, medium-bodied spice flavors, and an earthy aroma. Made from a grape native to Northern Italy, Sangiovese is often used for Italian Chianti wines. Syrah- This flavorful wine originates in the Rhone region in France and has many raspberry, pepper and spice aromas and flavors. In addition to France, the grape for Syrah is now also very successful in Australia. Zinfandel- Although much of Zinfandel is turned into a sweet blush wine called White Zinfandel, Zinfandel is a red wine made from the most popularly grown grape in California. The hearty grape is very adaptable to a producer’s manipulation, making it very versatile. Zinfandel is very fruity, with raspberry, cherry, and plum tastes. Blush Wines- Blush wines or rosé wine, which have a lighter pink color, are made by removing the skins of red grapes early in the fermentation process. This technique also lightens the flavor of the red grapes, creating a more delicate wine. White Zinfandel is actually produced as the product of “bleeding” regular Zinfandel, or removing some of the juice to heighten certain flavors and color in the wine. The juice is then fermented separately. 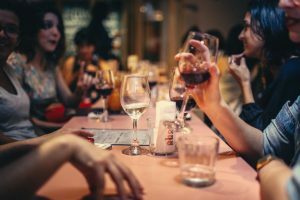 Wine and Food Pairings– Traditional wisdom on pairing wine with food dictates that white wine pairs well with white meats and red wine with red meats. 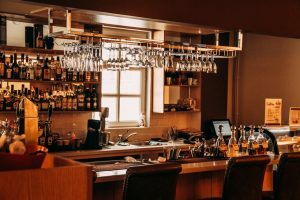 In recent years, more creative sommeliers (the person in charge of wines at a restaurant) have shown that this rule is not always necessary or even correct. The sauce and the preparation of the food are most important to wine pairing, and many different wines may work well with a certain dish. In general though, the best rule of thumb is to try and match more delicate flavors with lighter wine like Riesling or Sauvignon Blanc, hearty cream flavors with medium bodied wines like Chardonnay and Merlot, and thicker meaty or spicy flavors with fuller wines like Syrah. When reading through these suggestions of wine and food pairings, keep in mind that there are no set rules.